Thank you for being a digital volunteer! It’s very important that this work is performed in a standardized manner, so please make the effort to read and follow these instructions. Harvard College Observatory Plate Stacks houses roughly 500,000 glass negatives. 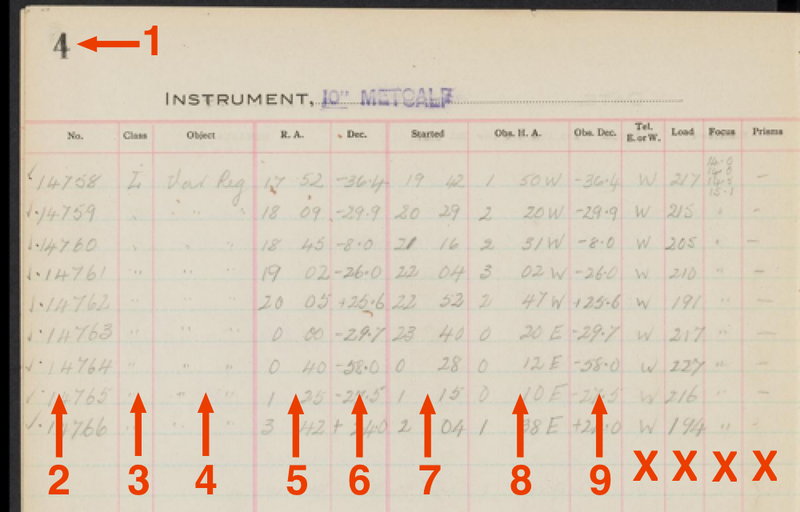 The metadata for each photograph were recorded at the telescope in a logbook. Thus, the logs are the original descriptive materials for the photographic plates. We have a total of 1,570 logbooks in bound and loose-leaf format. Each image is a photograph of two logbook pages. We are transcribing the data from 13 columns of the page. Please read the instructions below for details of how to transcribe each column. This project is transcribing thirteen columns, row by row (or line by line). When you enter data in the bottom-most row, a new row will be generated. 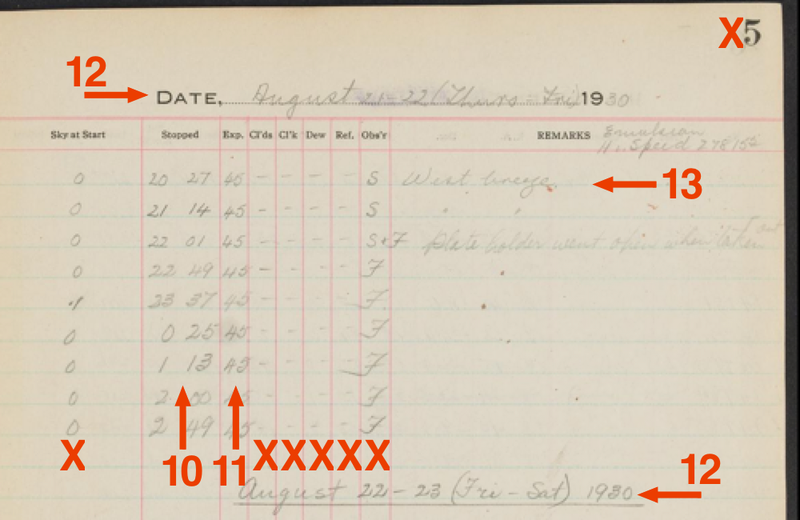 The number at the top left is the page number to transcribe. All numbers will be even. Do not enter the page number at the top of the right page. The “Plate” column defines the number for each plate. All numbers proceed in chronological order. Carefully enter the number, while checking the preceding row to ensure the numbers are chronological. The “Class” column defines the type of emulsion and exposure. Classes are L (blue sensitive), M (multiple exposure), Ec. Class letters may be followed by a superscript of 1 or 2. These should be transcribed as L1 and L2. These numbers mean L1 was yellow sensitive and L2 was red sensitive. Where a “ (ditto mark) appears, please copy the class from the record above. Column 4 describes the object the telescope was imaging. Where a “ (ditto mark) appears, please copy the object from the record above. Column 6 describes “Dec.” or Declination. Declination is measured in degrees, like Earth’s latitude. Declination spans +90 to -90. Keystrokes are entirely numeric, with a - to indicate South. Transcribe exactly what you see, specifically the number of decimal points. Column 7 describes “Started” or the exposure start time. The start time operates in a 24-hour format. Keystrokes are numeric, with a space separating hours from minutes and minutes from seconds. Hours of time span 0-23 - Minutes of time span 0-59 - Seconds of time span 0-59. The format is HH MM SS so you would transcribe: 19 42 - in this example image, there are no seconds so it is left blank. Column 8 describes “Obs. H.A.” or the Observed Hour Angle. The Hour Angle appears similar to standard time and is normally followed by an “E” or “W” for East or West. Use a space to separate hours from minutes of time. A space also separates minutes from E or W, e.g. 1 50 W as shown in the example image. Column 10 describes “Stopped” or the exposure stop time. The stop time operates in a 24-hour format. Keystrokes are numeric, with a space separating hours from minutes and minutes from seconds. Hours of time span 0-23 - Minutes of time span 0-59 - Seconds of time span 0-59. Column 11 describes “Exp.” or the plate’s length of Exposure time in minutes. Keystrokes are entirely numeric and should be one, two or three digits. Column 13 describes miscellaneous remarks about the exposure. Please transcribe the content of the remarks column in full. Outside of the specific areas we've asked you to capture in each section, please ignore and do not attempt to capture any additional information on the logbooks.